My colleague Ariel Zylberman has organized a one-day academic workshop here at UAlbany, coming up on March 15. The topic is constitutivism about moral norms— the view that norms are presumed by the very nature of action and agency. The powerhouse list of speakers comprises Matthias Haase (Chicago), Michelle Kosch (Cornell), Sharon Street (NYU), and David Velleman (NYU). The official commenters will be Hille Paakkunainen (Syracuse), Francey Russell (Yale), Jason D’Cruz (UAlbany), and Paul Katsafanas (Boston University). 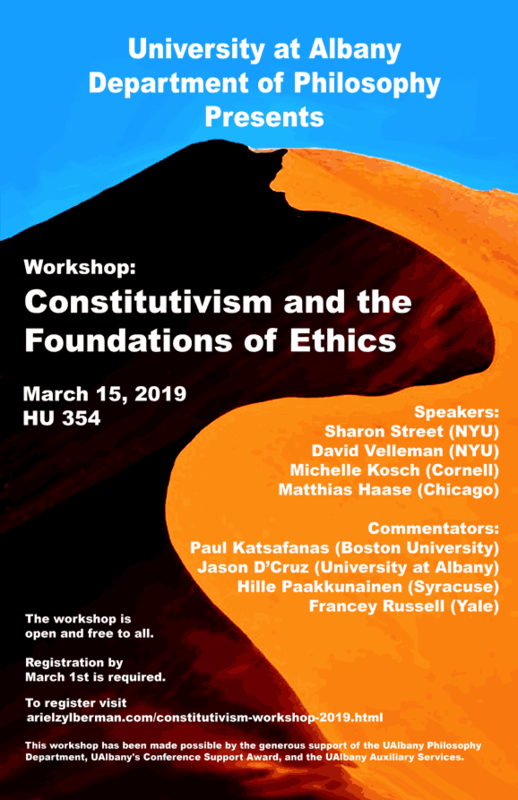 If it sounds like your kind of thing and you might be in the capital region in mid-March, more information and the registration form are at the workshop webpage. It’s a free workshop, but Ariel is asking that attendees register by March 1.